It’s been a bumpy ride for DreamWorks Animation since its conception in the mid-90s. For every good film they released (Antz and Chicken Run), innumerable mediocre films followed (Shark Tale and Bee Movie). In recent years though, with the success of both the Shrek and Madagascar franchises and How To Train Your Dragon, they’ve displayed what they’re truly capable of. With their recent release The Croods, however, it seems as though they’ve misplaced some of that spark. The Croods – Grug (Nicolas Cage), Ugga (Catherine Keener), Eep (Emma Stone), Thunk (Clark Duke) and Gran (Cloris Leachman)- are a mismatched prehistoric family who spend their lives confined to a rocky cave dwelling, foraging outside only for food and brief infusions of sunlight. However, when Eep, during a moment of sheer recklessness, crosses paths with Guy (Ryan Reynolds), The Croods must come to the realisation that the world is changing rapidly around them if they hope to survive. 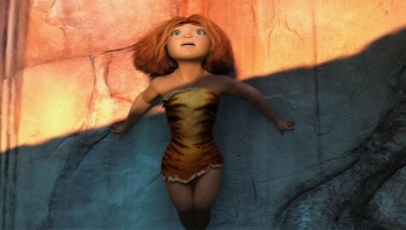 The idea behind The Croods (it was originally meant to be an Aardman film) – that the world is constantly changing and we have to embrace it rather than rebel against it – is a decent enough foundation for which to build a successful kids film around. However, in the hands of co-writers and co-directors Chris Sanders and Kirk De Micco, the messages are left entirely unclear, with notions too convoluted and unclear for the audience to unravel at the speed to which the film progresses. The narrative, too, is filled with plot-holes as it blunders along as – almost in succession of one another – each character has a life-changing epiphany. As it reaches its midway point, it becomes clear that even Sanders and De Micco are unsure of their overall intentions, with an uneasy blend of reality and fantasy encapsulating the poorly planned feel the film possesses (It’s like it’s set during the dawn of the prehistoric age, yet one that’s populated by completely fabricated Avatar-like creatures). Thankfully, and much to the merit of the animators and voice actors, there’s some mild enjoyment to be had amongst the wreckage. The design of the film is hugely impressive, particularly when it comes to the rendering of surfaces (dust-covered plains, rich forests and deep seas are all covered), and there’s some stunning vista shots that perfectly highlight the technical wizardry of CGI. With their voices, the entire cast add a level of excitement to the disorientating narrative. DreamWorks Animation are sure to take a hit with The Croods. It’s not that it’s overtly terrible (the animation is, as ever, first rate), it’s more that even for its target audience, it’s much too confusing and heavy on allegory to follow. What’s more – and the thing that’s most disappointing – is that it feels like a poor man’s version of Blue Sky Studio’s original hit Ice Age, which is now more than ten years old. Next time, replace religious allegories with unique gags and an inspiring plot.